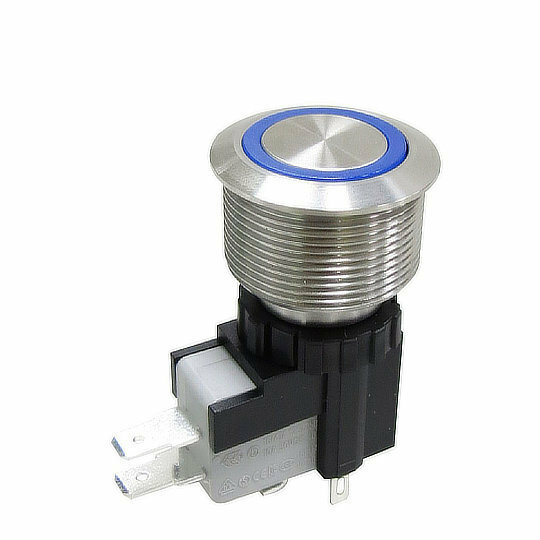 The MW25 series of high current illuminated vandal resistant pushbuttons from Dailywell are single pole switches with single or double throw operation and momentary or latching action. Electrically rated to 26A at 250VAC/125VAC for 10,000 cycles and 16A at 250VAC/125VAC for 50,000 cycles and a mechanical life of 1 million cycles for momentary and 500,000 cycles for latching. The MW25 series is designed with replaceable micro-switch and bushing for easy maintenance. The MW25 series of high current illuminated vandal resistant pushbuttons from Dailywell are single pole switches with single or double throw operation and momentary or latching action. Electrically rated to 26A at 250VAC/125VAC for 10,000 cycles and 16A at 250VAC/125VAC for 50,000 cycles and a mechanical life of 1 million cycles for momentary and 500,000 cycles for latching. The MW25 series is designed with replaceable micro-switch and bushing for easy maintenance. The MW25 series also meets a waterproof rating of IP67 on the panel side and is available with or without LED illumination in a choice of 5 single colours or 2 dual colour variations and designed to fit a panel cut out of 25.2mm. The MW25 series is perfect for applications such as Industrial Control Systems, Medical Devices, Security Monitoring Equipment, Vehicle Peripherals, Audio-Visual Equipment and Energy Storage Equipment.